happy stampede! is it something you “celebrate”? i go to maybe one thing a year, if that, but do wish i had a better view of the nightly fireworks from my balcony. i’m still in search of a semi-private place with a great view. it’s usually a time i like to leave the city for less crowded spaces. the mountains are always my number one, but places like lake lousie and banff will be busy no matter what. instead, i take the dusty road – literally. 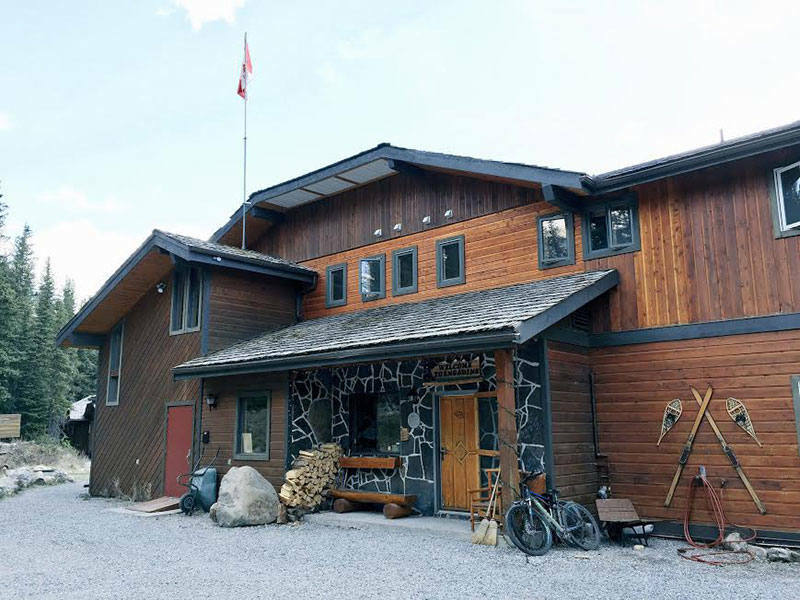 tucked away on the smith dorrien trail is Mount Engadine Lodge. it’s located conveniently close to canmore, but you won’t believe it when you reach the untouched wilderness that surrounds the beautiful Lodge. 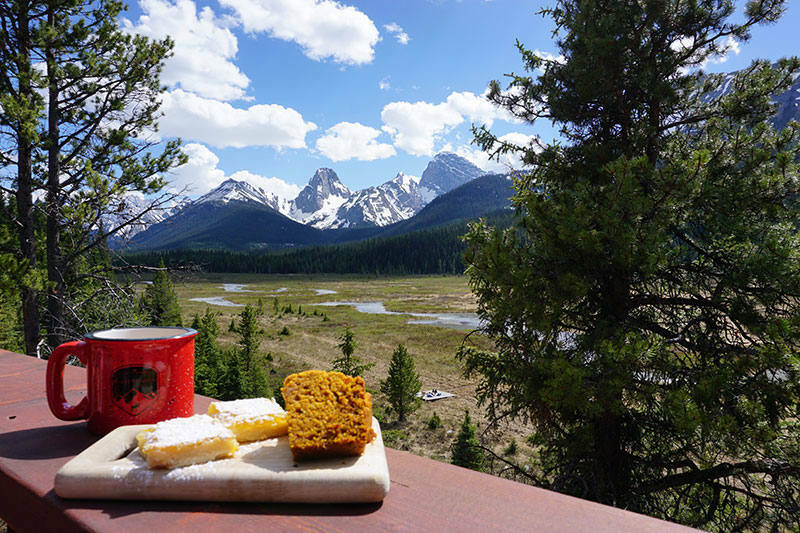 i took sister for afternoon tea at Mount Engadine Lodge when she was here in late may. we hiked Ha Ling in canmore before taking the short drive over to the Lodge. we felt proud and accomplished from our climb, but also sweaty and dirty. a quick road-side change in the back of our Ford Escape was in order. i’m not sure a wet wipe “shower” has ever felt so good. i was semi-clean, in an adorable dress, and my top knot hid any evidence of my hiking hair. we later found out that casual is a more than fine way to arrive for tea. i stand behind the old adage that you can never be overdressed. plus, my off the shoulder, full-skirted, black dress always makes me feel cute. meals are complimentary to guests of the Lodge, but non-guests can make a reservation (not always required, but better safe than sorry) and join for tea or dinner. afternoon tea is served every day from 2-5 p.m. for only $17.50 per person. so affordable! once you check-in, find a seat out on the patio or inside the cozy Lodge. we picked two large, red muskoka chairs with an incredible view of the mountains, but i’m calling dibs on the overstuffed club chairs by the fire in the winter. 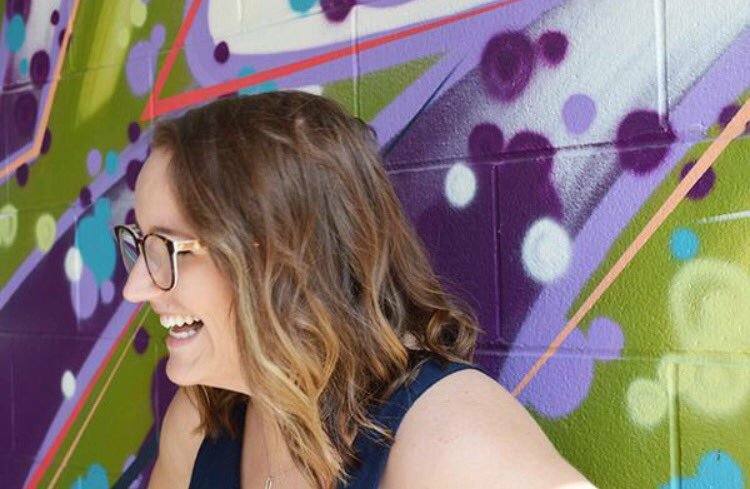 tea and coffee are self-serve; pick from a variety of Canadian tea blends from Banff Tea Co. or freshly brewed coffee from Canmore’s Mountain Blends Coffee Roasters. i made myself a pot of the cream early grey, and sister decided on a cup of coffee – she’s not much of a tea person. 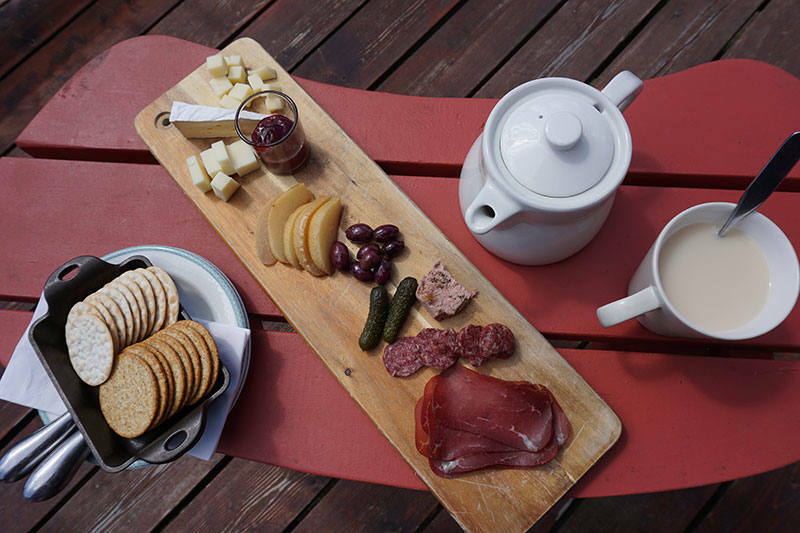 first, savoury: an assortment of fresh fruit, local meats and refined cheeses. while i don’t eat pickles or olives, sister was happy to have them all and i was the most delighted by the homemade jam. sweet came next. the freshly baked goodies on the day were lemon squares and pumpkin loaf. sister and i are both little old ladies at heart, so lemon squares are on the top of the dessert list for both of us. on the flip side, neither of us is too crazy about the everything-pumpkin-spice craze. but the loaf smelled incredible, so we took a nibble. “i hate pumpkin, but this is really good,” sister exclaimed to one of the staff members – it was even better topped with the delicious homemade jam. 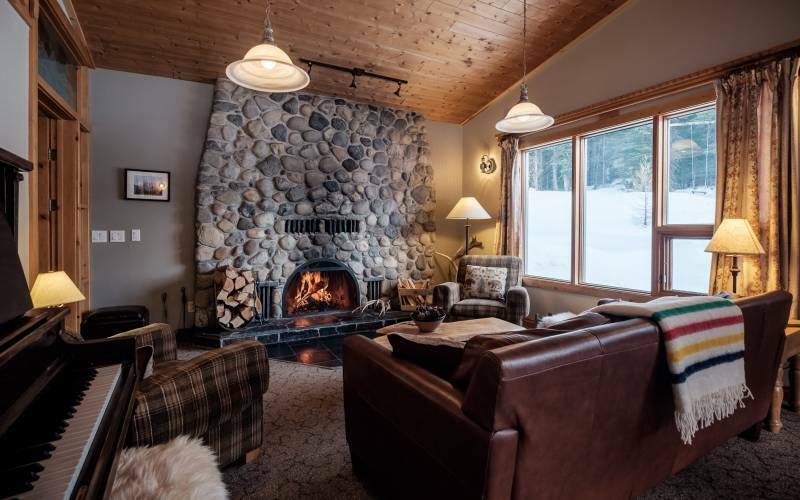 after you’ve finished your snacks, you can play a game in the lounge, walk around the grounds and try to find the elusive moose, or just bask in the sun on the patio and take in the stunning views. time really does slow down out there. i’m looking forward to my next relaxed, casual mountain visit. maybe in a glmaping tent! thank you, Mount Engadine Lodge, for hosting the two of us for tea. Previous Post oh hello, july.